Rekam Inc. Honored with Product of the Year 2014 Award – 29 April 2014 . Canadian company Rekam Inc., one of the world's manufacturers of portable electronics, photo and video equipment, once again won a prestigious National Prize Product of the Year 2014. Digital Frame DejaView SL101 – 21 April 2014 . Rekam presents new digital photo frame DejaView SL101. Digital Frame DejaView SL775 – 21 April 2014 . Rekam presents new digital photo frame DejaView SL775. Rekam Mini-Light Ultra M-250 SB Kit – 11 February 2014 . Rekam announces new studio flashes kit Rekam Mini-Light Ultra M-250 SB Kit. Rekam Mini-Light Ultra M-250 SB Kit is based on 2 studio flashes Rekam Mini-Light 250 (250 J). Metal, super slim digital frame DejaView SL 85M – 27 January 2014 . Rekam presents new super slim (width 3,5 mm) digital photo frame DejaView SL 85M. Its 8” display with 800 x 600 resolution guarantees great quality pictures. Super Slim Digital Frames VisaVis L-125 / L-135 / L-170 – 25 December 2013 . Tablet PC Citipad 3G-105 BQ – 06 December 2013 . Rekam announces new Tablet PC Citipad 3G-105 BQ. 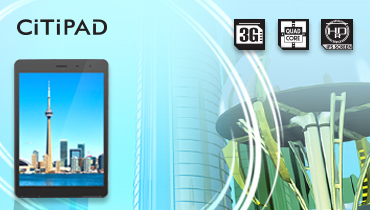 Citipad 3G-105 BQ runs Android 4.2.2 OS, which provides the high performance. The tablet has Quad Core CPU,10.1” display, built-in 3G, WiFi and 6000 mAh battery. Tablet PC Citipad 3G-905 BQ – 05 December 2013 . Rekam presents new Tablet PC Citipad 3G-905 BQ. The tablet runs Android 4.2.2 OS, has Quad Core CPU, battery with a long life time, IPS 9.7” screen and built-in 3G and WiFi. Tablet PC Citipad 3G-805 BQ – 05 December 2013 . Rekam presents new Citipad 3G-805 BQ. Tablet PC Citipad 3G-785 MQ – 25 November 2013 . Rekam presents new CITIPAD 3G-785MQ. It runs Android 4.2 and equipped with quad core MTK MT8389, Cortex A7, 1500MHz processor and 1GB of RAM. As the result the tablet offers solid performance and five hours of battery life. Tablet PC Citipad 3G-910 RQ – 22 November 2013 . Rekam announces new CITIPAD 3G-910 RQ. The CITIPAD 3G-910 RQ runs Android 4.2.2 and equiped with quad core, Rockchip RK3188, Cortex A9 1600MHz, what insures its high performance. Tablet PC Citipad 3G-702 – 22 November 2013 . Rekam presents new Citipad 3G-702 – compact tablet PC with built-in 3G, Wi-Fi and GPS. DayLight FL-52 KIT (KIT 2), 54-KIT (KIT 2), 56-KIT (KIT 2) – 22 November 2013 . Rekam presents new Lightning Kits based on fluorescent fixtures. New Series of Filters – 01 October 2013 . Rekam presents new series of circular polarizing (CPL) filters - Z PRO SLIM, ultraviolet (UV) filters - Lite PRO, X PRO SLIM and filter kits Starter KIT based on 3 filters. Pyramid. New series of bags for photo equipment – 25 August 2013 . New Rekam Pyramid series: RBX-51/53/55/57/59 and RBX-6000(backpack) are designed for active lifestyle people. These bags are convenient accessories allowing secure your equipment and providing fast access to any content. These bags are made of nylon fabric in different sizes and colors. Digital Frames VisaVis L-120,130,150 – 10 July 2013 . Tablet computers Citipad L800 / L810 3G. – 28 May 2013 . Rekam announces new tablets Citipad L800 and Citipad L810 3G. Tablets come equipped with dual-core Rockchip cipset RK3066, 1 GB RAM and quad-core graphics. Citipad L800 and L810 3G tablets run Android 4.1 and equipped with built-in Wi-Fi and 3G (3G only for L810). Digital Frame DejaView F105 – 29 December 2012 . Rekam announces new digital frame DejaView F105. The digital frame DejaView F105 is equipped with 9,7" display, and could be used for personal and advertising purposes.